Jesper Jensen is head of the LEGO Boost design and engineering team, and confirmed that the set will include three motors — two motors integrated into the main hub and one external motor — along with a sensor. 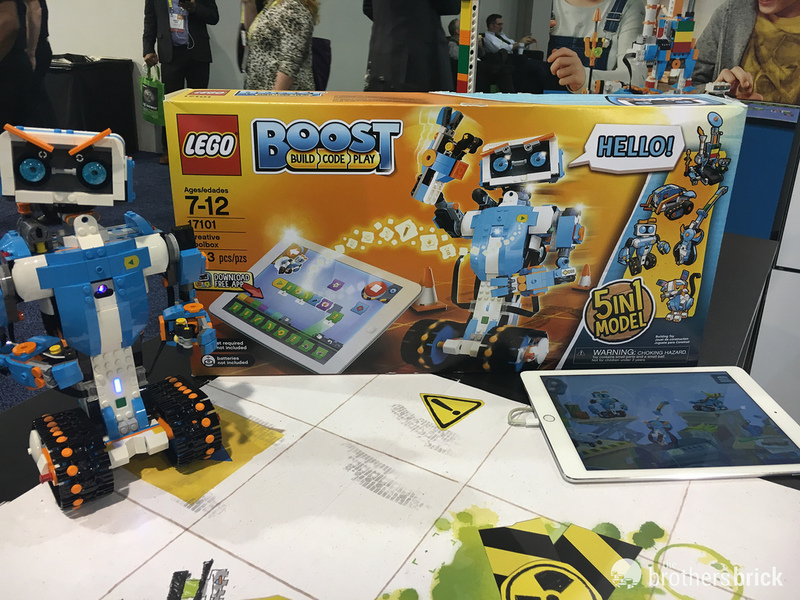 While similar to both Power Functions and Mindstorms, LEGO Boost motors and sensors are designed to work specifically with the simple coding features of the tablet app (more on that later), and will not work with Mindstorms when Boost launches this August. The set includes five alternate models: “Vernie” the robot, an electric guitar, “Frankie” the cat, some kind of tracked vehicle called “N.T.R.4”, and a 3D-printer (which especially intrigues me and I’m disappointed I didn’t have time to try it at the booth — guess I’m going back tomorrow). Frankie the cat is adorable (if oddly colored for a cat), with expressive ears, eyebrows, and whiskers. I asked Jesper what his favorite model was, and he said that it had to be Vernie, though the “Guitar 4000” was the favorite among the kids during the extensive play-testing that LEGO Boost has gone through during its development. The main programmable brick pairs via Bluetooth to a tablet app. By day, I run the standards development team for Bluetooth wireless technology (which is why I’m at CES), so it was particularly rewarding for me to see how easily Lasse was able to pair the main programmable brick to the app with just the touch of a button. 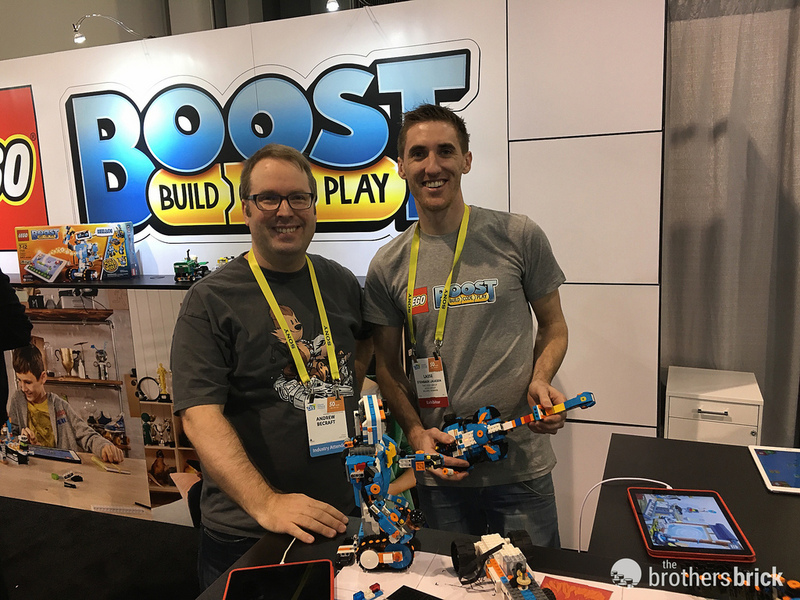 Thinking ahead to how adult builders will inevitably use LEGO Boost to power motion in their models at large conventions like BrickCon and Brickworld, I asked Lasse and Jesper what their plans were to handle situations where numerous LEGO Boost sets and multiple apps were present in the same area. 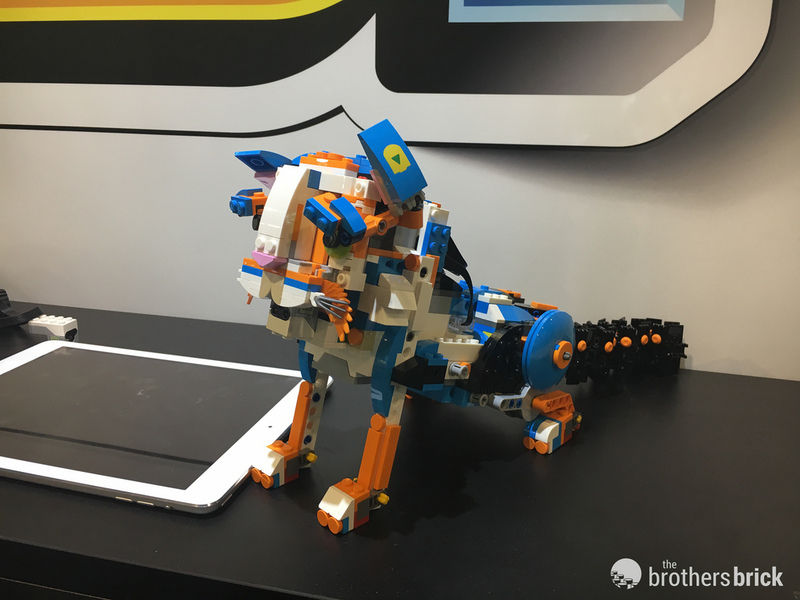 While they acknowledged that the product is being designed primarily as an entry-level LEGO robotics kit for kids to play with at home and no solution for the issue is currently available, it was clear they’re aware of this challenge (which I expect would also be an issue in a school as well). The coding app will only be available at launch on iOS and Android tablets like iPads or Samsung Galaxy Tabs, and unfortunately, there are no current plans to support PC, Mac, or phones. With the product launch 8 months away in August, the prototype app that Jesper and Lasse demoed for me had its limitations, but they are planning to enable users to drill down into many of the grouped default behaviors to move the logic around a bit more. Overall, the coding logic is fairly linear, without any branching logic through if/then/else conditions — just reactions to stimuli from the sensor. Condition statements are a concept at the core of nearly every programming language, so this was a bit disappointing to me, but if this helps get kids started with the basics earlier, I’m all for it. Software developers often use LEGO bricks as a metaphor, particularly with the modularity of object-oriented programming, so it’s only fitting that LEGO creates its own modular coding system. As Jesper demonstrates in the video below, you move blocks of behaviors into a sequence on screen, and then you can “play” the sequence, including any sensor-driven reactions you build into the flow. Despite being 8 months away from the release, the app looked polished, with a great user experience and solid performance — there was no lag as you dragged modules around on screen. It’s clear that the Boost team has invested in plenty of usability testing to ensure kids will be successful with the app. LEGO is always very careful about talking about future products. 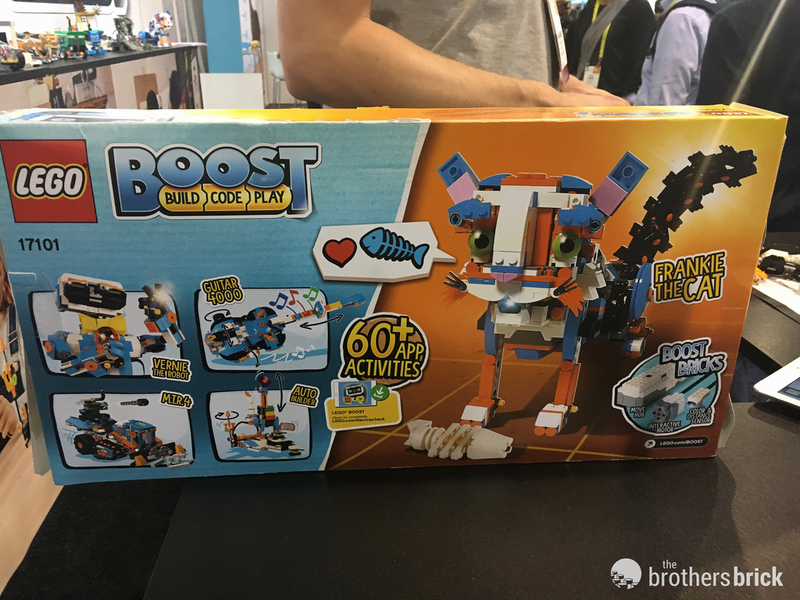 And no wonder — I saw no fewer than three separate LEGO Mindstorms knockoffs (some “compatible” with LEGO bricks, some not) on the show floor at CES, and it’s understandable that LEGO doesn’t want to reveal too much about the future of LEGO Boost too far in advance. 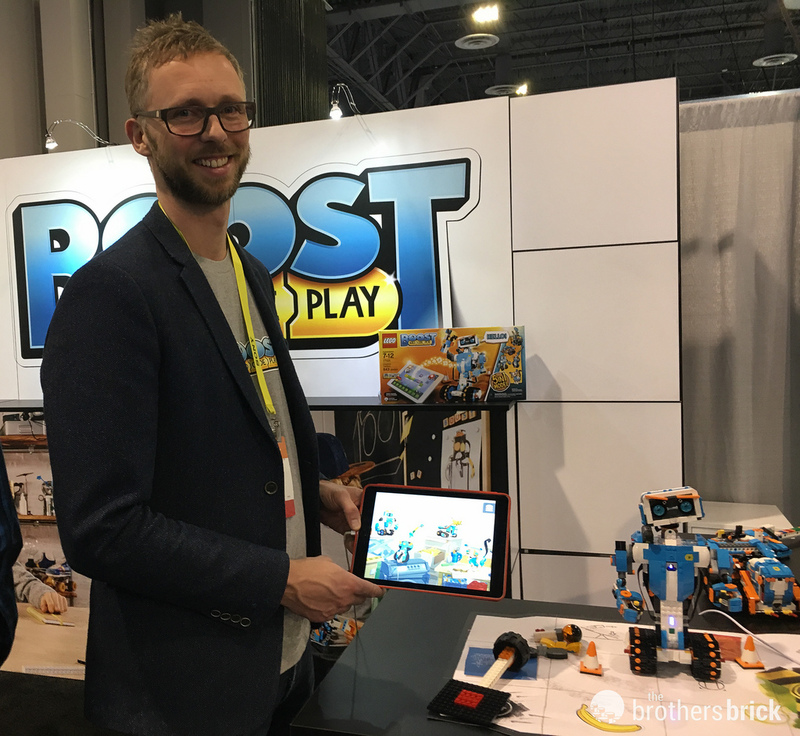 Nevertheless, when I asked about how LEGO Boost fits into the Power Functions and Mindstorms ecosystems, Jesper told me that LEGO Boost is an entirely “new brand”. Similarly, it’s clear that the engineering team has many ideas for what the new system is capable of beyond the initial product launch this year. Ultimately, the team would like to enable integration across LEGO’s robotics family. Despite having spent my entire professional career in technology, I’ve honestly never been that interested in Mindstorms. To be honest, it’s probably because I’ve always been a System builder and tend to treat LEGO as a form of artistic expression rather than another opportunity to exercise engineering skills — I do that enough at work! And I know that there are many adult builders out there like me. For non-Mindstorms LEGO builders like me and many others, the System-based foundation and straightforward modular coding in LEGO Boost has the potential to significantly reduce the learning curve for motorizing our models in interesting ways — without having to master Technic or Mindstorms. 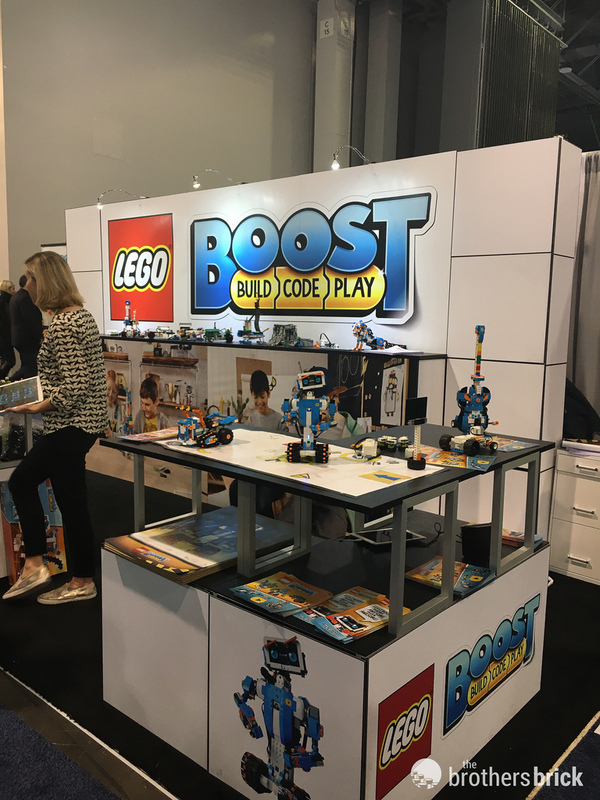 In other words, LEGO Boost offers a gateway to inject life into models without a serious commitment to programming, wiring, or studying gear ratios. I can easily imagine moving models in every section at a LEGO fan convention or in a school environment (assuming the engineers move away from one-to-one Bluetooth pairing and take advantage of more features the standard has to offer). 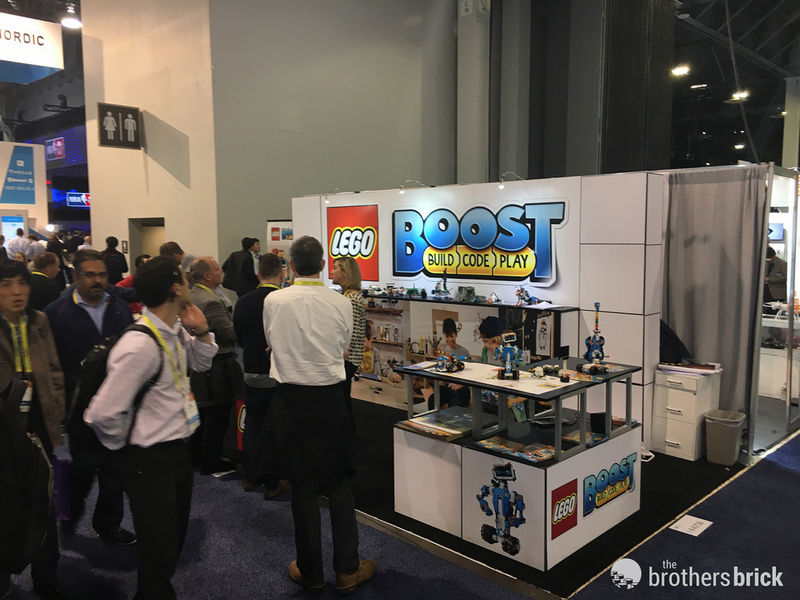 I’m quite impressed with LEGO Boost, and it seems clear to me that LEGO is committed to making its new product line a success — not just a throwaway experiment or a one-time release. That’s pretty exciting, not just as a LEGO fan but as a technologist as well. I’m interested to see how this compares to WeDo which is the existing Lego Education Robotics System for 7+ year olds. Do you know if it is in any way compatible? My problem with Lego Android software is they can be very specific – like specific Samsung or HTC models in addition to Android versions, sometimes exclusive to phones. That make it very limiting. I will not be purchasing it until I review their Android App. Remember, don’t compare to the LEGO games by Tt put out by Warner. Those are not directly from LEGO directly.